Steve Huston smiles and leans forward, gently bearlike, as he remembers the days before recreation was his full-time job. On evenings and weekends during the 1970’s, when his work as a mail room supervisor complete, he would head outside to organize ball games. The kids were the residents of the Parkchester Condominiums in the Bronx, where Huston has lived with his family for 26 years, and where he now serves as director of recreation. Since taking the reins in 1990, Huston, 53, has transformed a department once thought of as a “babysitting” service to one that offers a range of programs designed not only to occupy kids but to help them develop physically, socially, and intellectually. Programs he has created include gardening, arts and crafts, and concerts, as well as after school tutoring and mentoring. He has also started aerobics classes for seniors, and created a small library and a computer lab for residents. In 2005, both the New York State House of Representatives and the U.S. Congress issued him certificates of commendation for his work on behalf of children. Huston’s drive to his his community—especially its kids–has its roots in his own childhood. Orphaned at the age of 7, he lived for a time with his grandmother, then in a home for boys and in foster care for several years before being adopted at 13. During those years, he remembers playing baseball on sand lots littered with broken bottles. “I used to think it would be good if we could be better organized,” he says. He is grateful to his adopted parents, Lawrence and Shirley Patterson of Baltimore, MD, for providing him with a loving home, he says. His career as a recreational innovator began in 1990, when he left his mail room supervisor position at Packett Press Financial Printers in Manhattan to take a part-time job as a recreation assistant at Parkchester. Previously, he had worked in a supervisory position in the mail rooms at several Manhattan law firms. At the age of 37 he decided to pursue a dream of greater fulfillment. “I was definitely a late bloomer, as far as knowing what my real calling was,” he says. Although Huston values the experience he gained in the business world, he experienced some burnout. Because he had volunteered his time at Parkchester—organizing tournaments and coaching—he knew the recreation staff and felt he could move quickly from assistant to a supervisory position. At that time, the recreation department served the community in a bare bones way. “The recreation department back in its day was basically a babysitting department,” Huston recalled. “We gave a basketball or softball to kids and made sure they didn’t get hurt. Huston became recreational supervisor of the west section of Parkchester in 1990 and, by 1996, director of recreation for the entire complex, home to some 17,000 families. Three years ago, he created a computer lab for the complex. With seven computers, the facility provides residents with tutorials in math, biology, chemistry, foreign languages, and typing, as well as SAT and PSAT preparation. On a recent afternoon, numerous youngsters were hard at work. Her friend Abigail Manu, also 12 and of Parkchester, said she appreciates the library, computer lab, and after school mentoring programs. “I’d be bored otherwise,” she said. 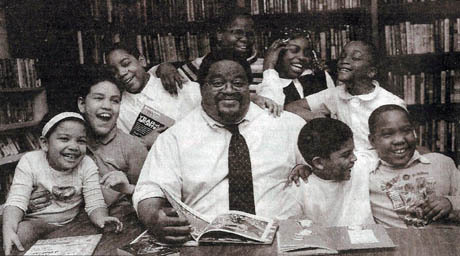 When the Parkchester library branch closed for renovations in 2004, Huston took the opportunity to create a minilibrary, which provides reading programs for toddlers and seniors. To help youngsters connect with nature, Huston initiated the Green Thumb Club. It provides supplies and supervision for children and senior citizens to garden together. This and other programs are the fruit of Huston’s unique drive and imagination, according to Margaret M.Walsh, board president of the Parkchester South Condominium, which administers the complex. “He’s a great community builder; he identifies needs in the community and fills them, often with his own creative ideas,” she says. In all, Huston estimates that Parkchester Recreation’s many programs serve about 90,000 to 100,000 people. “We say it’s just for the Parkchester community, but we’d never dream of turning a child away,” he says. Although the programs he has initiated have been hailed as great successes, persuading some to embrace his ideas took time. One plan for the future is to offer children two workshops—journalism and video production–with the help of MAC Creations, a private educational firm. State Assemblyman Peter Rivera will coordinate funding. Huston credits his wife Marva, 58, and their three children with patiently enduring the years when he worked 12-hour days to build the department, helping him succeed. “With my family’s understanding and support, I was able to do what I had to do,” he says. One of his daughters, Chanel, 23, is a hands-on helper, volunteering her talents as an arts-and-crafts teacher. This entry was written by Heather Robinson and posted on March 28, 2006 at 1:05 pm and filed under Profiles.